Video Game Mondays: Let’s 100% Paper Mario Parts 1 and 2! | Jesse Hecht C.R.E.A.T.I.V.E. Video Game Mondays: Let’s 100% Paper Mario Parts 1 and 2! Hello, everyone! 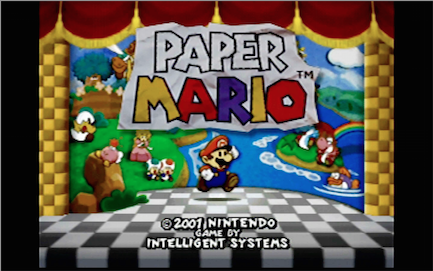 Welcome to Let’s Play Paper Mario for the Nintendo 64! I’m JesseHechtCREATIVE and I have a rotating panel of guests, most notably Miz Kriss and PSWII60, but there’s always room for more. I rented this game when I was way young back in 2001, and then I actually got it (with guide) a few months after (I never got into its predecessor, Super Mario RPG, until the late 2000s). I have replayed it once a year for the past few years until I thought, “Why not make this a Let’s Play?” So here we are. According to Wikipedia: Paper Mario was introduced as Super Mario RPG 2 (later called Mario Story in Japan on release). First revealed at Nintendo’s trade show Nintendo Space World ’97, the game was developed by Intelligent Systems with consultation provided by Shigeru Miyamoto, who said that the game “was being developed with amateur gamers in mind.” It was later re-released on the Wii (2007) and WiiU (2015) Virtual consoles, so if you’d like to watch and play along, this is still available to download (and hopefully soon to be on the Switch). On a side note, it was also released on the iQue Player in 2004. Battle Mechanics: Turn-Based battles are the name of this game, with Mario, his allies and enemies taking turns swapping hits until one runs out of HP (health) or Mario Runs Away. FP are Flower Points, points used for Badge Attacks. Jump – Mario Jumps on the enemy. Doesn’t work on Spiked enemies. May use FP. Hammer – Mario hits an enemy with his hammer. Doesn’t work on Flying enemies. May use FP. Star Power – Mario summons a Star Spirit to aid him. Costs up to three Star Bars. Items – Things Mario purchases at shops or finds to aid him. They can restore his HP/FP or cause a number of other effects to himself or the enemy. Strategies – Run Away (from battle), Switch Partner (change ally), or Do Nothing (waste a turn). Self Explanatory. What makes this different from most RPGs is the active ways the battles are fought. Instead of just pressing a button to attack and the turn is over, Mario can affect his and the enemy’s damage output by pressing one or several buttons during the attack animation to hit harder and defend better. Timing is key, but there is a little bit of lee-way when it comes to the time the button is pressed (though not as much as Super Mario RPG). Badges are also another change. Badges, when equipped, take up a certain number of allotted badge points. Powerful Badges take up more points, so there is a certain finesse to using them, choosing a mix of more powerful and less powerful Badges is paramount to victory. When leveling up, a bonus of 5 HP, 5 FP, or 3 BP (Badge Points) can be selected and I always choose BP (there are several badges that can raise HP and FP). The Badges themselves range from Attack and Defense Boosters to Out-of-Battle Effects, to even Sound Effects! The sheer number of combinations are limitless so long as you have a lot of Badge Points! Out-of-Battle is an experience all its own. There are so many characters to talk to, quests to perform, errands to run, Star Pieces to collect (trade them for Badges), and places to go that your head will spin faster than Mario does in this playthrough! But enough about myself and the game, let’s dive in. Grab your printing sheets and markers! Let’s get folding. Re-Uploaded with new JHC Bumpers! More episodes will be added as time is marching on! Expect two episodes every Monday! Thanks for watching and enjoy! Next > Toy Tuesdays: Marvel Legends Reviews! Bucky Cap and Agent Coulson!